Congratulations to Great River Health Systems for earning top honors for an outstanding Patient Experience in the first quarter of 2017. Four locations from Great River Health Systems ranked in the Top 10% nationally for overall patient experience based on composite scores. Learn more about SurveyVitals Top 10% Award. Great River Health Systems is a regional health-care system that includes Great River Medical Center, retail pharmacies, retail medical equipment and supplies providers, and physician clinics in Mediapolis, Wapello, Fairfield, Fort Madison, Keokuk, Mount Pleasant, and West Burlington, Iowa. 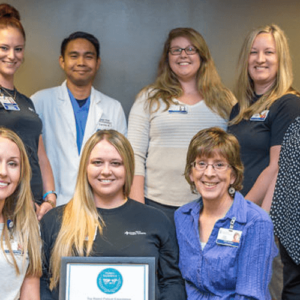 More than 120 physicians and 2,100 employees share Great River Health Systems’ commitment to excellence in patient care and community service. In honor of National Nurses Week we examined 4,196 nurses and 286,738 SurveyVitals® patient satisfaction surveys received in 2016 on nurses’ behalf. Check out the top 3 rated areas for both the Anesthesia Patient Satisfaction Questionnaires (APSQ/APSQ2) and the Standard Patient Satisfaction Questionnaire (SPSQ). Are these what you expected? 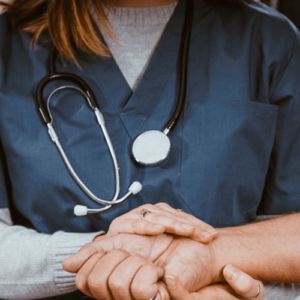 What do you think nurses do best? SurveyVitals Anesthesia Patient Satisfaction Questionnaire (APSQ), asks 14 questions which fall into 6 question areas. Questions are based on a likert scale of 1 to 5. Patients receive surveys via SMS (text-message), Email, or Interactive Voice Response. 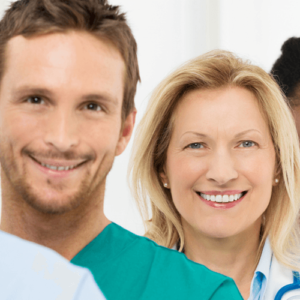 SurveyVitals strives to send surveys to the entire patient population for the highest quality feedback. The following graphic represents all the areas pertinent to anesthesia providers. SurveyVitals Standard (Outpatient) Patient Satisfaction Questionnaire (SPSQ), asks 16 questions which fall into 5 question areas. Questions are based on a Likert scale of 1 to 5. Patients receive surveys via SMS (text-message), Email, or Interactive Voice Response. SurveyVitals strives to send surveys to the entire patient population for the highest quality feedback. The following graphic represents all the areas pertinent to outpatient providers. 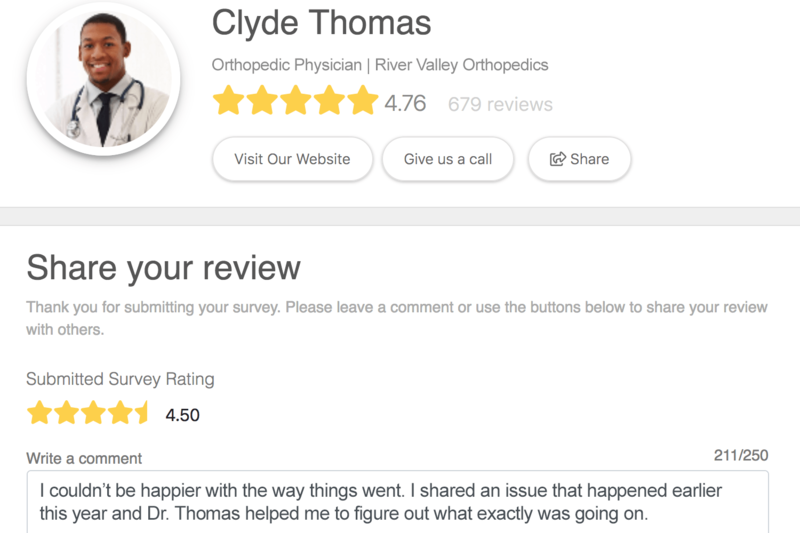 *Results derived using results from 286,738 completed SurveyVitals patient surveys collected between January 1, 2016, through December 31, 2016. Interested in learning more about the SurveyVitals solution? Schedule a demo today. What do you think? Does this correlate with your patient experience scores? 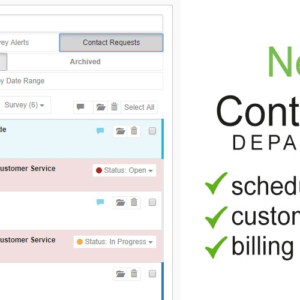 Prioritize patient contact requests by department with the newly released Contact Me Department. Added as an addendum question to a SurveyVitals’ survey, ‘Contact Me Department’ asks patients to categorize their contact request by selecting from a list of common areas, such as billing, scheduling and customer service. 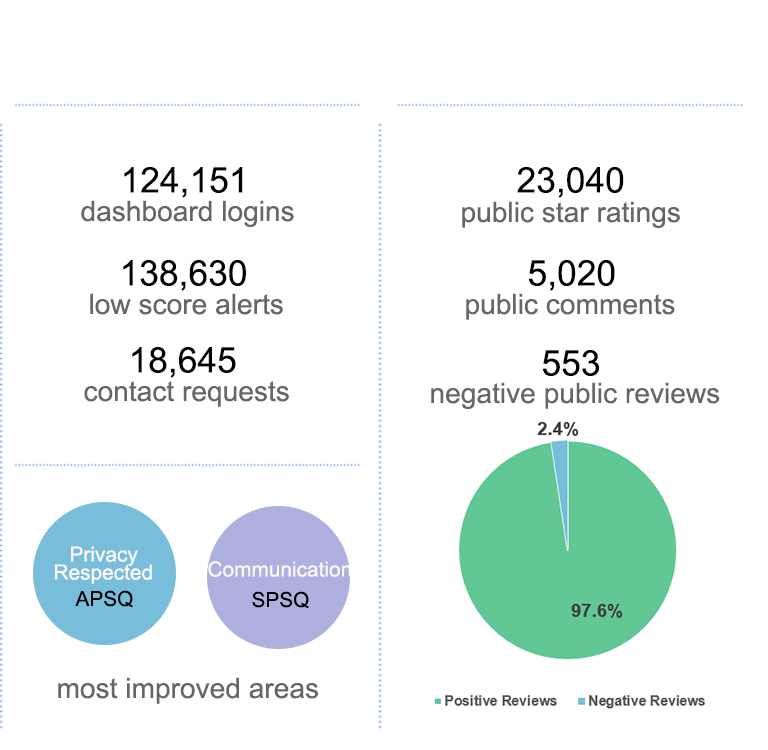 This new level of granularity not only makes sorting through potential patient complaints or requests faster and easier, it also gives organizations the ability to identify commonalities among patients and track trending. If notifications are enabled, users will automatically receive an email as soon as a patient completes a survey with the area of the contact request included. Additionally, users can access the Alerts page when logged in to see detailed information about who would like to be contacted, and why a contact request was made. Want to get started with Contact Me Department? Get in touch with your client account manager or email us at support@surveyvitals.com. New here? To learn more about what sets SurveyVitals apart from other patient experience solutions, email us at info@surveyvitals.com to setup your demo today or drop us a line using the blue chat icon below. Interested in learning more about SurveyVitals? Schedule a demo today. Take a high-level view of what patients are saying about you with the new Semantic Keywords BETA module, now available on your SurveyVitals dashboard. This new reporting functionality represents qualitative survey comments quantitatively, giving you the ability to track trends and see which positive and negative keywords patients most frequently associate with your organization. Based on a peer-reviewed study, emotional keywords found in your survey comments, words like “happy” and “sad,” have been assigned a value between -100 and 100. 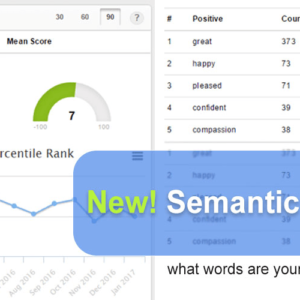 In the Semantic Keyword module, you will find two gauges representing your percentile ranking against your peers (showing the percentage of those peers that score below you) and the mean score of your emotional comments from -100 to 100 (Negative to Positive). You will also find your percentile ranking over time and a list of the top 5, most-used positive and negative emotional keywords. These metrics can be viewed for 30, 60 and 90 day periods. Schedule a demo to learn more today. Questions? Message us using the blue chat icon below to speak to a member of your support team or to get more information about SurveyVitals. 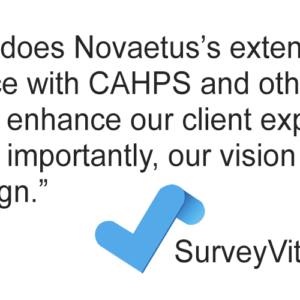 SPRINGTOWN, TX – SurveyVitals, Inc., a healthcare analytics company specializing in patient experience surveys, today announced it has acquired Novaetus, Inc., an administrator of CMS-certified “Consumer Assessment of Healthcare Providers and Systems” (CAHPS) surveys. The acquisition broadens the scope of SurveyVitals’ services to include CAHPS administration and other related consulting services. Novaetus was founded in 2004 as a marketing and consulting company initially working with a small, select group of clients. Based in Novi, Michigan, the company quickly expanded, becoming one of only 37 vendors in the United States certified by the Centers for Medicare and Medicaid Services to administer CAHPS surveys. 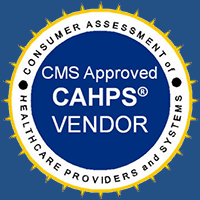 Novaetus’s CAHPS certifications include Outpatient and Ambulatory Surgery CAHPS (OAS CAHPS), Physician Quality Reporting System CAHPS (CAHPS for PQRS), Home Health CAHPS (HHCAHPS), In-Center Hemodialysis CAHPS (ICH CAHPS), CAHPS Hospice Survey (Hospice CAHPS), and CAHPS Patient-Centered Medical Home (CAHPS PCMH). Moshier joins SurveyVitals as CAHPS Program Director. She brings a wealth of industry knowledge and oversees day-to-day operations of CAHPS administration and other survey projects. Novaetus employees remain in their current roles and same organizational reporting structure. SurveyVitals will maintain its headquarters in Springtown, TX, with additional offices in Minneapolis, MN, Boise, ID and Novi, MI. With the acquisition, SurveyVitals now serves 391 healthcare organizations and over 16,000 providers, and operates across 38 states. A suite of survey tools and data-driven insights provide a 360° view to improve client organizations. Terms of the transaction will not be disclosed. 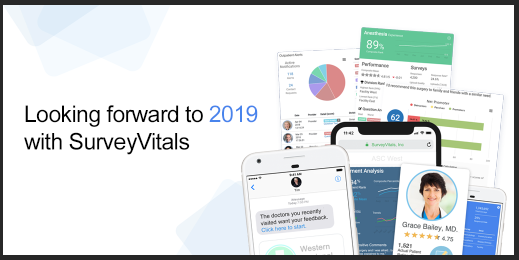 SurveyVitals inspires positive change in healthcare by providing real-time, actionable patient feedback to providers and organizations through innovative technology. 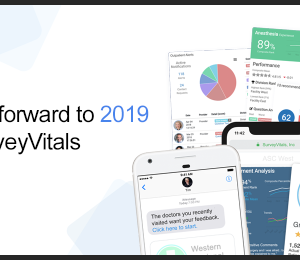 With intuitive, in-depth reporting via online client portals and a benchmark of over 5 million completed surveys, SurveyVitals provides the tools needed to succeed in today’s rapidly changing healthcare landscape. For more information, visit www.SurveyVitals.com. Learn more about SurveyVitals CAHPS offerings. The start of the new year marks one of the biggest changes Medicare has seen it its 50 years – the transition to the new Quality Payment Program (QPP) under MACRA. The QPP overhauls the way in which clinicians treating Medicare patients are reimbursed and combines and sunsets three big CMS programs: Meaningful Use, the Physician Quality Reporting System, and the Value-Based Payment Modifier. Your participation decisions in 2017 and how your scores compare to your peers will affect your Medicare reimbursement in 2019. Not quite sure of all the ins and outs of the program? Visit our MACRA 101 page first to learn more. 1. SurveyVitals can help you satisfy reporting requirements. Your SurveyVitals solution can help you meet more than enough measures in the Clinical Practice Improvement Activities category to satisfy reporting requirements. Additionally, for anesthesia providers, SurveyVitals anticipates being able to help clients satisfy a measure in the Quality category. CMS has not yet released the list of approved non-MIPS measures that can be reported via a QCDR, but says it will do so in early spring. The MIPS program is a part of the larger Quality Payment Program which has two tracks – the MIPS track and the Alternate Payment Models (APM) track. 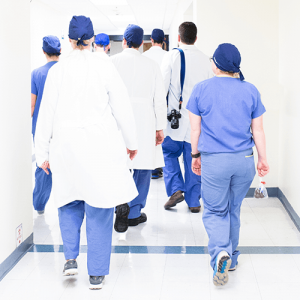 Most all Medicare Part B clinicians will participate in MIPS, while a smaller percentage will qualify as an advanced APM and participate in the APM track. 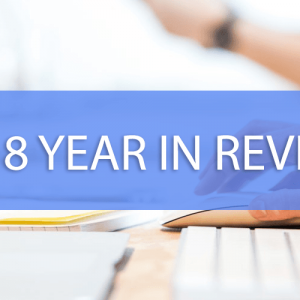 See the list of CMS-approved APM models for program year 2017 here. 4. CAHPS for MIPS is optional, regardless of group size. Previously named CAHPS for PQRS, CAHPS for MIPS is not required under the new program, regardless of group size. This is a notable change from PQRS as groups over 100 or those participating in GPRO previously had to participate in CAHPS. The increased flexibility under MIPS allows clinicians to forego participation in CAHPS, and, instead, identify clinical measures in their specialty to optimize their scores in the quality category.